Welcome to the One Year Anniversary Special post for Fallout: Equestria! 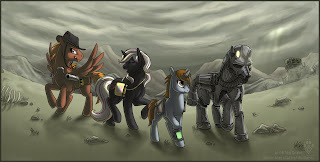 A year ago on this day, a little story called Fallout: Equestria was posted to Equestria Daily. It had done the rounds on a message board for video games and had been pretty well received, and various readers suggested Kkat try her luck with EqD. A few passes through the pre-readers later and it was posted. And updated. And updated. And updated. A little over 624k words later, the epic behemoth of a fanfiction has finally been completed... but the story goes on within the community built up around it and in a plethora of sidefics. In this post, we'll be taking a look at the backstory, some of the characters and just what inspired Kkat to write it. For those who haven't read it, beware of spoilers! There's not much can be said without spoiling some aspects of it, so be warned! 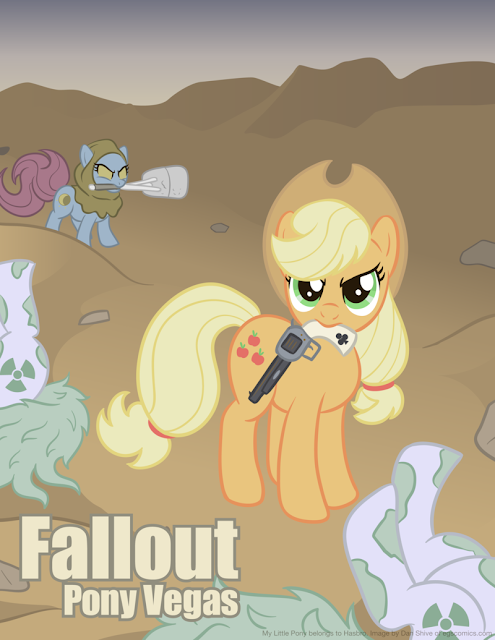 As linked above, the New Fallout: Equestria Sidefics Post has been updated too, with 77 sidefics to read and enjoy. More on FO:E itself though, after the break. 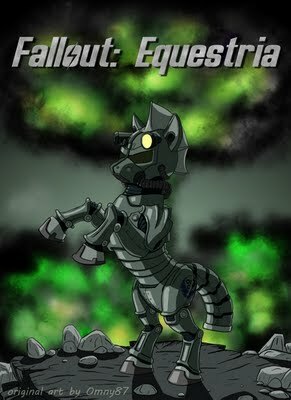 My Little Pony has been ripe for crossovers since the beginning (of FiM at least). Maybe it's the character driven nature of the show, or the adaptable magic-driven world they live in, or maybe it's just a given that if it exists, there will be a pony crossover of it. Whatever the impetus, Dan Shive drew a little picture, linked above (click for source). Kkat saw that picture, and the rest (as they say) is pretty much history. When her crush, Velvet Remedy (on the right, above), who is slated by her cutie-mark to be the resident musical pony but who desires to be a healer, tricks Lil'Pip into helping her escape the stable so she can follow her dream unhindered, the technically proficient Junior PipBuck Repair Pony decides to follow her into the great unknown that used to be Equestria... now simply known as The Wasteland. Equestria, ravaged by war, plagued by radiation both magical and non, covered with an endless curtain of clouds from where the Enclave (the pegasi nation) have sealed up the sky. 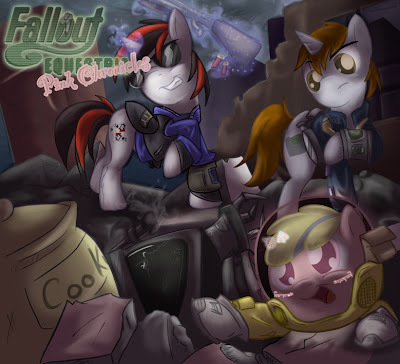 The Wasteland is a dreadful place, as Littlepip (so called because she was the youngest and the smallest) finds out. Almost immediately, she is beset upon by raiders and forced to fight for her life. 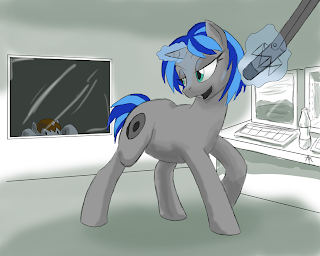 However, Littlepip gains friends, gains skills, and eventually learns to not only cope, but to thrive. She doesn't have many magical skills like most unicorns, she only really knows one spell, telekinesis. This one spell, however, proves versatile and powerful. 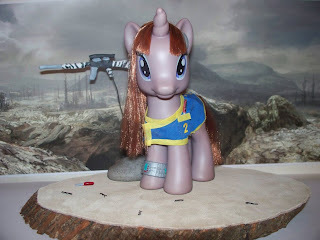 Eventually she can pick locks and toss around huge objects, and armed with her trusty PipBuck and the Eyes Forward Sparkle, Minimap and inventory spells, she becomes a force to be reckoned with, a force for good, and one that will leave an indelible mark on that hell-hole of a Wasteland, just as it will leave its mark on her. The story is huge. It has a massive, overarching plot that takes our plucky little heroine to numerous locations, each unique, and to numerous characters both good and bad. She finds love, loses her innocence and gains notoriety and fame, wanted or not. In the end she unravels the mystery surrounding just what went wrong over 200 years ago, and what happened to the characters we know and love from the canon show. 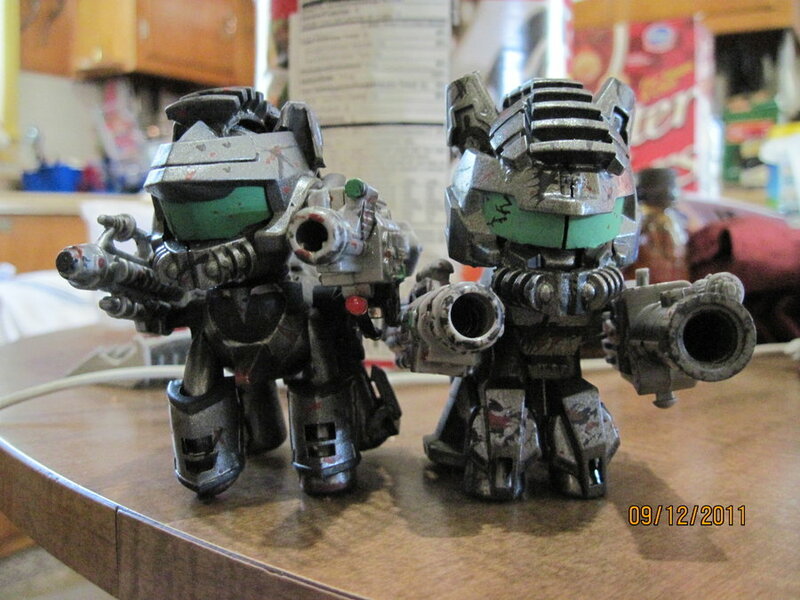 It's perhaps no surprise that the story gave life to multiple side stories, but it has also given life to custom models, songs and art, like those below. 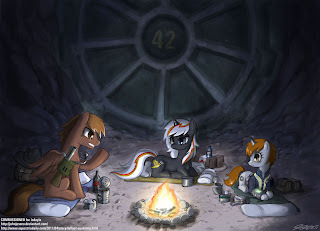 Click the above for a gallery of Littlepip'ness! 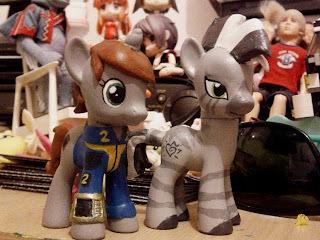 Here we see a custom Littlepip with Xenith, her zebra friend. Don't get on the wrong side of SteelHooves, for him there is no overkill, only open fire and I need to reload. 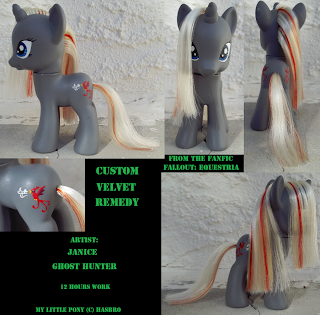 And this is a custom Velvet Remedy. 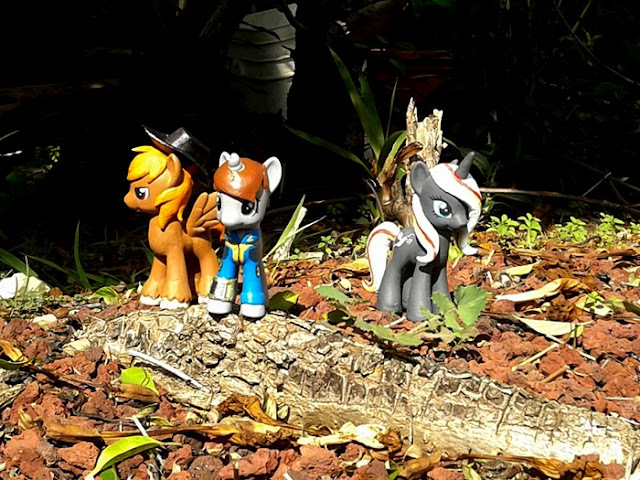 FO:E is available in PDF format, online as google docs and some crazy ponies are even planning on getting it printed, so where does it go from here? Well, that's kind of up to you, the reader. Or maybe you, the writer. 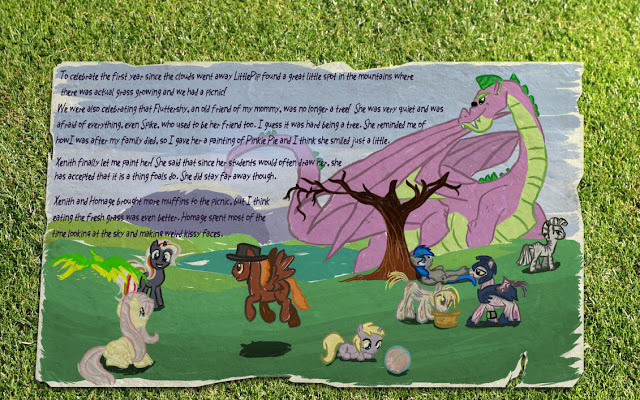 Fallout: Equestria has plenty of stories left to tell - as evidenced by the mammoth 77 story update to the new side-story post. It's a huge, fun, expansive world to read or write in, and it looks like it is set to be enjoyed for a long time to come - it's currently being translated into four languages, and the Russian translation is almost complete. So jump in and give it a whirl if you haven't. I've only recently finished it and think it's well worth your time - though I do have to recommend a single concise download over google docs, not least because it has bookmarks. New Pony DVD on the Horizon! Music: Hay There Ms. Derpy!